One goal of a facility renovation is to ensure that current occupants are happy and comfortable in their environment while making the facility more appealing to prospective occupants. But if indoor air quality isn’t properly managed throughout the job, negative outcomes — such as sick employees and upset tenants — could undermine the whole project. This may sound like an overreaction, but it’s not. People have heightened awareness about and sensitivity to environmental pollutants and toxins at work and in their homes. They tolerate less risk to their health than in the past and will be quick to complain to facility management, building owners, and human resources. It only takes one person with a serious allergy or breathing issue to derail a project and affect the reputation of the facility management company and contractor. For example, if left unmanaged, construction dust can aggravate allergies, cause an asthma attack, and even lead to lung disease in people, while also damaging equipment and electronics. Because of this, it’s critical that good indoor air quality is maintained during a renovation, especially in high-density buildings where occupant sensitivities may be unknown. While many risks are an inherent part of being in business, it’s essential that this risk is managed before and during a project — not after the damage has been done. Be transparent and communicate often. Asking the right questions and having good working relationships with all contractors and subcontractors allows facility management leaders to relay need-to-know and safety information about the project to their building occupants. Communications about the project should include a list of materials that will be used and any expected disruptions. Advance notification will be appreciated by employees and other occupants. It will enable them to ask questions, address potential concerns, and communicate any allergies or special requirements before these become a significant problem. Many renovation projects create an immense amount of dust, including some not visible to the naked eye. If the dust isn’t managed effectively, it can migrate from the work area and permeate into other areas of a facility, quickly escalating into in a serious problem. In fact, according to the U.S. Environmental Protection Agency (EPA), exposure to small, and even microscopic, dust particles created during a renovation can cause serious health issues affecting both the lungs and the heart. Facility executives need to select a contractor that understands and applies dust control best practices. This includes isolating the work area, sealing vents and air ducts, and establishing negative air pressure while maintaining proper ventilation. For example, an air scrubber can collect dust particles before these are able to migrate throughout the building. Renovation projects can introduce strong odors and volatile organic compounds (VOCs) into the space and cause a number of health symptoms, including headaches and irritation to the eyes, nose, and throat. VOCs are included in some paints, sealants, carpeting, flooring, and wall coverings, among other materials. 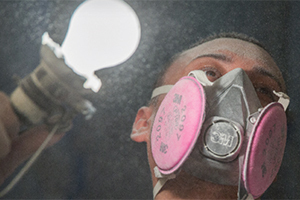 When possible, work with the contractor to select low VOC emitting products. Make sure the building is adequately ventilated and schedule work with high VOC emissions during off hours to limit exposure.